Get your very own reserved desk in an open area shared with other members of the community. It’s dedicated, so you can leave your things like desktop computer without having to take everything with you at the end of the day. You also have 24/7 access to your desk. As a member, you also get to use our exclusive business address for mail and permits, receive discounts on add-on conference room hours, and access to other premium perks. Join our community of doers! The Estación membership is ideal for those who don’t need a private office, but prefer a permanent desk to work, the convenience of staying after hours, catching up on work during the weekends, and access to a conference room. 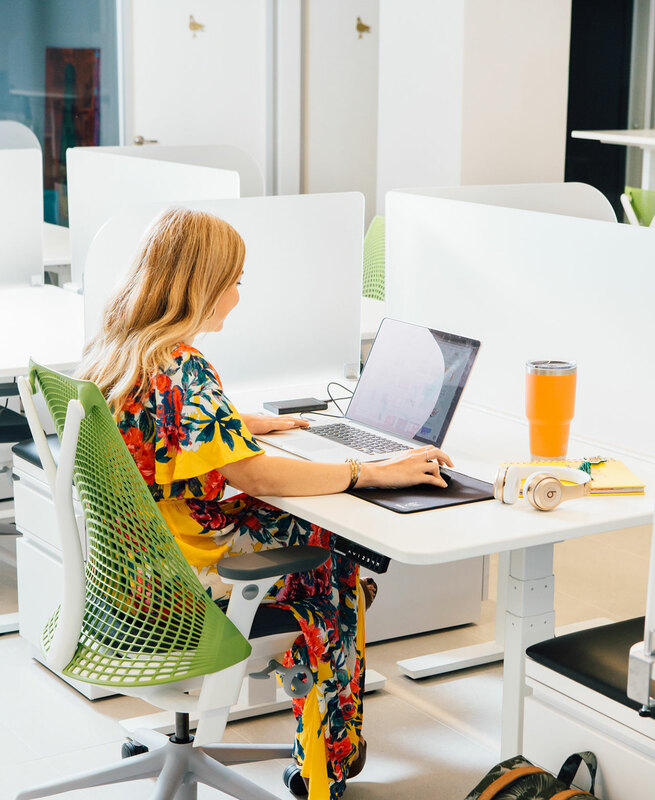 Choose your preferred location, settle down on our Herman Miller ergonomic chairs, connect to Aeronet’s Gigabit1, and delight on our freshly-brewed coffee & snacks while you work. Available in Old San Juan for $350/month and Santurce & Milla de Oro for $450/month. Get inspired to do your best work in our community of doers. Check out what’s included in the Estación membership and the amenities included in every Piloto 151 membership. conference room hours a month. and $30/hour in both Santurce & Milla de Oro. As an Estación member, you receive your own personal code to print in the Copy Center of your chosen location. You can print, scan to email, and make copies. You will be charged at the end of the month: $0.10/copy for B&W and $0.20/copy for Color. As an Estación Member, you receive two complimentary conference room hours. Add more as you need with member discounts: $18/hour in Old San Juan; $30/hour in Santurce and Milla de Oro (40% member discount). Our conference rooms have capacity for 10-13 guests and are equipped with AV equipment. Book the conference room through your digital account in the Members Area or call the front desk of your location of choice. Is the Estación membership a flat payment? Yes. It is $350/month in our Old San Juan location and $450/month in our Santurce and Milla de Oro location. However, if you need any additional services, typical charges range from mail forwarding, copy center printing, additional conference hours, and parking. You can also get 10% discount on your monthly membership with a 1 year commitment and 15% discount with a 2 year commitment.